Tour some of the County’s best backyard escapes when the Foundation of the University at Presque Isle hosts its first ever Backyard Getaway Tour on Saturday, Aug. 25, from Noon to 3:30 p.m. This rain or shine fundraiser for the Zillman Family Greenhouse offers tours of seven “seriously awesome backyard escapes” in the Presque Isle area, including garden houses, a stand-alone man cave, and a live-in tree house. Tickets are $20 each, $30 for VIP tickets, and free for children under 12; all tour-goers will receive a Backyard Getaway wrist band that serves as their admission to the tour stops. To give participants a true tour-going experience, organizers are offering up seats on Molly the Trolley for the first 30 reservations, departing from Gentile Hall. The trolley will take guests from stop to stop to view the she sheds and garden getaways. Those who miss this opportunity will need to provide their own transportation to these spots, which are available for viewing in no particular order. In addition, there will be a VIP reception from 3:30-5 p.m. on the President’s Patio at UMPI. This finale will feature light refreshments for our guests and tour hosts, celebrating the end of a fun-filled day. Stops in the tour include Margie Hunter’s Peony House at 44 Maple Grove Road. This retreat was built in 1904 as living quarters for a hired hand and was transformed into a gardener’s paradise, complete with dried flowers, birds’ nests, and antiques. Just down the road, Roberta Griffiths’ Garden House at 369 Fort Fairfield Road serves as both an escape and a vantage point. The space is filled with gardening tools and trinkets and includes a screened in porch. Across the street is CK Keegan’s Man Cave at 368 Fort Fairfield Road. Complete with screens and a drop-down canvas, it’s the perfect spot for summertime napping. As a special treat for participants, Myrtle Tree Farm will offer a 25% discount on purchases to those with wrist bands on tour day. A jaunt along the river will take visitors to Edie Greiner’s Teach Samhraidh at 57 Johnson Road. 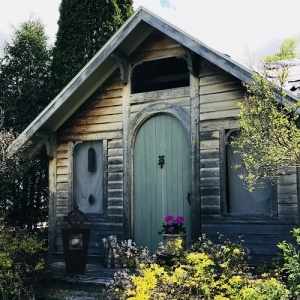 Irish for Summer House, this escape is nestled into an apple tree orchard and serves as a tranquil spot for everything from dinner parties to summer reading. Swing back Presque Isle way and head north up Route 1 to see Scott and Llori Keirstead’s Backyard Hideaway at 208 Caribou Road. Located in a stand of fir trees and with an old windmill head for a backdrop, this Amish shed features a barn-styled sliding screen door and glass bricks that let in the sunlight. Head into downtown Presque Isle to view Rollie Wight’s Treehouse at 12 Wilson Street. This tiny, live-in treehouse was constructed in 2014—it’s crowned with an old microwave Radar cover and sits on 10-foot-tall antenna tower parts. Across town is Claude and Marilyn Lamoreau’s Log Cabin at 96 Pine Street. 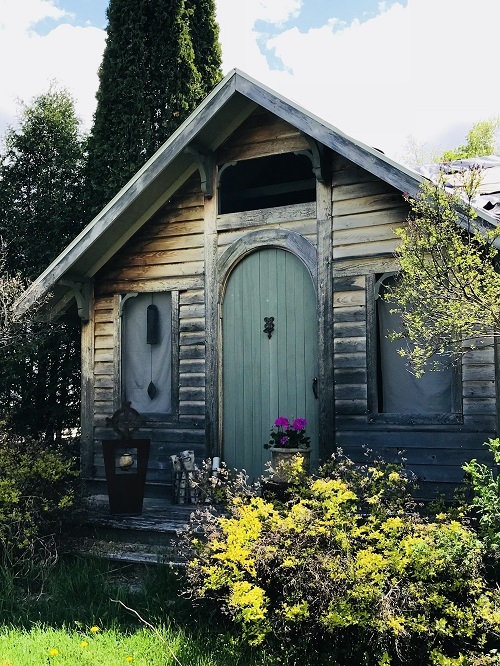 Nestled in the woods behind their house, this Canadian kit houses a treasure trove of Fiesta ware, baked enamel flatware, antique games, and a Franklin style potbellied stove. Free transportation will be provided on Molly the Trolley for the first 30 reservations to the President’s Office. Cost is $20 per person, or $30 per person for a VIP ticket, which includes the finale at the UMPI President’s Patio. Children under 12 are free. Tickets can be purchased at UMPI’s President’s Office in Preble Hall, at the Campus Store in the Campus Center, from Foundation board members, or at any Getaway stops on the day of the event. For more information about this event, please call Deborah Roark at (207) 768-9755 or email deborah.roark@maine.edu.